By Melissa	| Published October 11, 2010 at 320 × 240 in Photos! This is how I stacked the trashy novels behind the door. 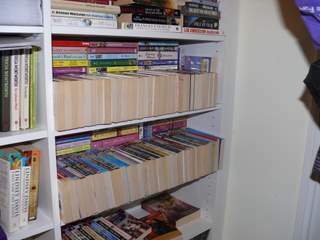 Books placed horizontally in piles because that allows 3-4 extra books per pile, then end-on and lying down in the front row. Lets me squeeze a lot more books onto the shelves!